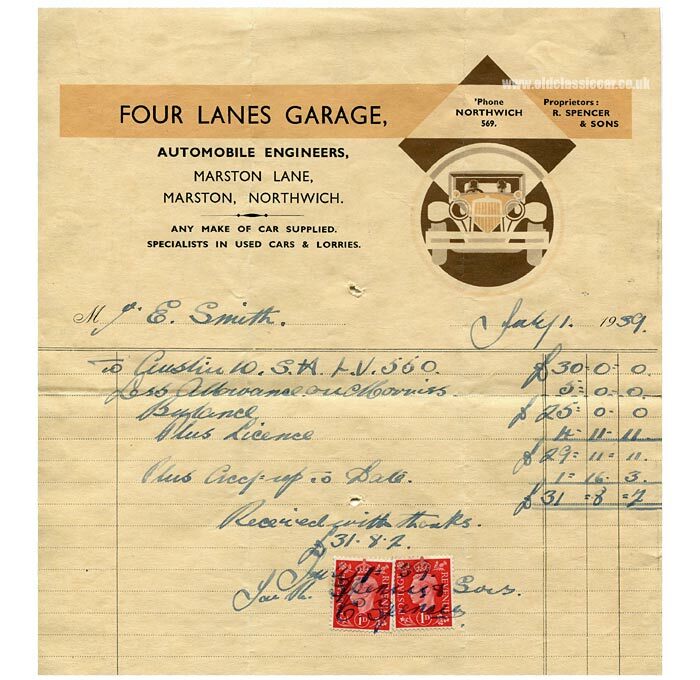 Sale of a 1932-1934 Austin 10 at Four Lanes Garage, in Northwich. Homepage. This page: Receipt for the sale of a secondhand Austin Ten, sold at a Cheshire garage. Four Lanes Garage (Automobile Engineers). I wonder how much use of his new (to him) Austin 10 Mr Smith was hoping to get, when he traded in his pre-war Morriss [sic] car for the Austin? This receipt was written up by Four Lanes Garage (Automobile Engineers) on 1st July 1939, exactly two months before the country was dragged into WW2. Restrictions on private car usage for the majority of motorists wouldn't be far away, so unless they had access to sufficient motor spirit, owners of Austins such as this one may well have had to stash their prized machines away, up on blocks in a garage somewhere. Other items of paperwork that came with this receipt though confirm that Mr Smith was able to continue driving throughout the war. The purchase price for the Austin was £30, less the £5 deducted for the car that he was part-exchanging. The receipt was signed by an employee of R. Spencer and Sons, proprietors of Four Lanes Garage in Marston, Northwich. Despite new Austin 10s being available at the time, the car's Liverpool registration (LV 550) was from a series that only ran for two years, from mid-1932 to mid-1934, so the Austin was a chrome-rad 10/4, circa 1933, of the type shown on this page within the vintage gallery section at oldclassiccar. Searching online brings up images of the garage in recent times, now retailing NWF fuels rather than used cars and lorries as it did in the 1930s. The garage is situated on Marston Lane (the A559), at its crossroads with Dark Lane and Ollershaw Lane, mid-way between Higher Wincham and Great Budworth. Other garages used in the area by Mr Smith included Over Tabley Garage, near Knutsford.